Thinking back on my entrepreneurial journey and the business support I’ve received, it is clear to me that the close business friends I had, trainings I attended, courses I took, mastermind groups I joined, and coaches I had have had a huge impact on the entrepreneur I am today. In business, it is important to have support. But how do you know when you’re ready for it? The fact is you always need support. You may be the only person in your company right now but that does not mean you should go it alone. The most effective and productive way to grow both personally and professionally is through accessing good business support. The catch? Not all support is right for you right now. You must focus on the “right things, in the right order, in the right time” as my coach Todd Herman says. That only begs the question, how do you know what those things are or what the right time is? Furthermore, who you turn to for support may be the most important factor in your support success. That’s because focusing on the, “right things, in the right order, in the right time,” but getting it from the wrong person for YOU could mean support failure. Who can you trust when the entrepreneurial training and coaching market is saturated and everyone has a promise to help you with XYZ? You name it… Have more leads. Close more deals. Make more money. Stop this. Start that. Everyone has a promise. There are people who coach on methods they don’t even use in their own business because they don’t believe in the value they’re providing! Right now, it is easier than ever for someone to start a coaching business and position themselves as an expert without proof or a track record. That is why it’s especially important you do your due diligence in deciding who to hire to support you. Don’t just jump to buy any program that sounds good. Be skeptical and hold the person behind the program to a higher standard. If you let just anyone into your world to shape you and your business, you’re doing both a great disservice. 1. Do they get (proven) results? As in, can I read reviews and talk to people who have worked with them? 3. Do they use the strategies and methods they teach in their own business? 4. How has their business grown and evolved? 5. Does their underlining methodology align with mine? 6. Are they a master on the subject they coach on? 7. Do I trust them? Total. Gut. Check. I also consider whether their promise is too big. In my experience it is best to work with a specialist, someone who has chosen their lane and become very knowledgeable on that subject. Take caution working with a person who coaches on everything. The saying, “jack of all trades; master of none,” exists for a reason. Choose someone who is a master at that one thing you or your business needs to get to your goals quicker. You owe it to yourself to learn from a master, not a jack. Once you determine who you want to learn from, you must decide which of their offerings makes the most sense for you, if any. You need to figure out what the right things are, in the right order, in the right time. The answers should be based on the stage of business you are in, combined with your goals and current lack of skill or knowledge. You have to focus on the activities that will grow your business at the right time. Determine which of Todd Herman’s 5 stages of business you’re in between Start Up, Ramp Up, Build Up, Scale Up, or Leader Up. If you’re just getting your feet wet as an entrepreneur, you’ll want to focus on totally different objectives than if you have an established business with a huge database of loyal clients. The stage of business you’re in matters greatly when considering your business support options. You must have clarity on your business goals and vision of success because taking a course, attending a training, or getting coached could change the trajectory of your business. Aligning your support with your goals is essential. If you buy a program that is not in alignment, one of two things will happen. You will a) fail to take action because it is not the right information or not at the right time or b) take action because you feel you must after making the time and financial investment, only to find you’re steered off course from your goals. Your support must align with your stage of business and your goals. Once you are clear about what to focus on based on your stage of business and goals, determine if you have a skill or knowledge gap that needs to be filled for you to take your business to the next level. It could be CRM systems, marketing, setting boundaries, scaling, lead generation, bookkeeping, writing sales copy, or even just confidence. Lucky for you, no matter what area you’re lacking in, there are people willing to help for the right price. Be discerning with your time and resources, investing them wherever you will get the biggest ROI. Once you are aware of your needs, choose from one of the 5 general areas of business support. Courses are an affordable way to acquire knowledge and many can be done online, in the comfort of your own home, and in your own timing. Choose a course whose topic directly aligns with your knowledge gap. ​Most trainings are either one-time trainings like a webinar or live workshop. Trainings can be economical options as well. Set out to learn about one topic instead of embarking on a quest to learn everything at once. If you attend every training, panel, and lunch and learn for fear of missing out, you could potentially miss out on everything! That’s because you can’t possibly take action on all the strategies and ideas you gain at once, nor should you. Masterminds can be anything from casual and unpaid to formal, paid, and professionally facilitated. A mastermind is an opportunity to gather with your peers who act as a sounding board to help you overcome your challenges. Masterminds are of great benefit because they bring everyone’s skills and knowledge to you. Because of their intimate nature, masterminds can change the trajectory of your business more so than most courses and trainings. Do a mastermind only when you’re clear about your challenges and highly value recommendations from your peers. Be wary of groups that call themselves masterminds but really are just a gathering of entrepreneurs with no structured purpose. Also, refrain from joining a group where everyone is very similar. Your strengths and weaknesses should complement each other so you can learn from one another. Because not everyone grows at the same rate and everyone starts off in different places, you will likely outgrow your mastermind or be outgrown somewhere down the line. Group coaching or one-on-one coaching is an opportunity to have a very tailored learning experience. Group Coaching is the more affordable coaching option and great if you thrive in a community environment and can learn from what others are going through in their businesses. Because coaching is such a personalized experience that will have endless ripple effects in your business, it is of the utmost importance that you choose someone with a specialty, experience, and a good track record, (i.e., talk to some of their previous clients instead of relying on a few favorable reviews). Also, never hire a coach who doesn’t have a coach. They either don’t believe in the value they’re providing or they’re not in the mindset that they have more to learn. Mentorships are very tailored experiences similar to coaching. They can be casual or formal; paid or unpaid. 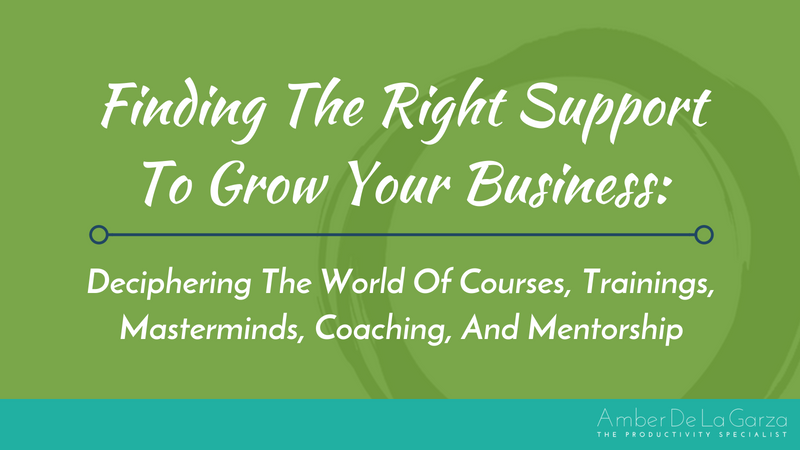 The biggest difference between the two types of support is that a coach will focus solely on improving your business, while a mentor will also walk you through how they got to where they are in business. A good mentor will pull back the curtain, giving you an insider’s look at the innermost workings of their business and walk you through how they overcame their own challenges and setbacks. A mentorship will have the greatest impact on you and strongly shape your trajectory above all other types of business support. If you are at a place in your business where you’re ready for support, don’t go in blind and buy the first course that pops up on a Facebook ad that sounds remotely like what you need. First, determine who you want to work with, what you want to focus on, and when it makes sense to do so. Then, choose the type of support that will best serve you and your business and take action on what you learn. Without taking action, nothing will change for you or your business.